I’ve never liked Valentine’s Day, really. First of all, shouldn’t you be all mushy and romantic everyday? Commercialized holidays shouldn’t tell us when to buy flowers or say nice things, should they? Fair enough, I’m probably just bitter and against relationships altogether. So, when I heard about Love and Friendship Day, a day in September that Colombians celebrate with great fervor — “a holiday that really is all about friendship”— I nearly puked. Do I really have to have two Valentine’s Days? One is enough torture for any woman to stand! Honestly! Every day of the week I got a happy from students, parents, and coworkers. 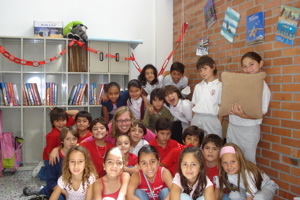 We added decorations to the room daily and my desk was covered in chocolates, sweets, a puzzle, a Colombian t-shirt, red paper hearts, even a poster with my name in glitter. I admit it, by Friday I, too, was all about love and friendship. I even wore pink and the lip gloss one of my angels gave me! I went home that afternoon with two dozen roses, a bouquet of daisies, and a newfound appreciation for holidays. There really is something special about love and friendship, isn’t there? Friendship keeps us grounded but never discourages us from seeing our dreams taking flight. Friendship assures that we never cry alone or eat pizza in solitude. It provides a sounding board and two arm hugs, fits of laughter, a work out buddy, and an “is he right for me?” radar. It’s throwing a frisbee in the dead of winter and driving in a green van listening to Journey headed for the beach. Friendship is memories, stories, secrets, and passing books along state lines or oceans. Friendship is saying, “Go! Go! I’ll send you mail.” Friendship is lasting and real and a lifetime full of treasures. Love is Momma’s biscuits and her waiting up for me. Love is the sound of Daddy’s tractor and the smell of his barn. Love is watching them ride down the driveway together in an old blue truck on a Sunday afternoon. Love is watching movies with my Sisser and seeing her as a counselor at Camp Lake Stephens. It’s my brother sending “diet coke could kill you” emails. Love is looking up at your grandmother’s funeral and seeing a crowd that is there because your heart is broken. Love is campers that grow up and still call you their favorite and students that think you’re a rockstar. Love is Mamaw patching my favorite jeans for the 52nd time and making sweet potato pie. Love is a choice, an action, a sacrifice, a precious, precious gift. Love is my Jesus, a cross, His grace. My friends, my family, I love you and I think maybe I’ll wear red on February 14th this year. This post was originally written as an email on September 22, 2007. Really…I love you, too. You are my friend, my family, and my sister in Christ. Thank you for what you give me in your writing and in you spirit. why in the world would you need a friend with a “is he right for me?” radar when you have a “does he have a ridiculously miniscule flaw that should keep me from liking him?” radar. generally your radar eliminates guys way before any of your friends get to. but for those few you do let slip by, thank heavens i have my “emily, be cereal” radar to make you think straight again. and yes i said ’emily’ because that’s usually what i have to call you when you’re not listening and making ridiculous arguments like “but he likes books, and he can write letters, and he likes frisbee” when really he’s the most socially awkward person on the face of the planet and generally just not cool at all. was that mean? maybe i’m bitter too. i mean, be cereal, em. just stick to boys that burn stumps on the weekends. at least their cute. or just quit all this dating nonsense altogether and hang out with a sisser. lawd knows i ain’t got no life. we can get a dog. oh, and momma waited up on you? that woman hasn’t been awake a single time i’ve come home after 9:00. i have to yell at her and tell her i’m home and she doesn’t even remember that in the mornings. and you misspelled valentine’s up there somewhere.